Yesterday’s “dinner-time revelation” by a MSM anonymous source was a memo by former FBI director James Comey that was read over the phone to a NY Times reporter. The letter detailed an Oval Office conversation Comey supposedly had with President Trump where the president Trump to get Comey to stop investigating General Flynn as part of the Russia investigation, “I hope you can let this go,” the president was said to tell Comey. 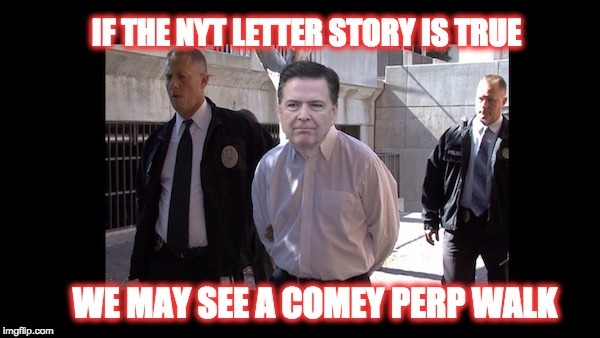 But If the Comey letter story is true, and the former FBI head really believed that the president was trying to strong-arm him into dropping the investigation…James Comey may end up in Jail. There are three possible outcomes of the NY Times story. The story could be false, there was no memo or Comey never wrote what was told to the NY Times over the phone. The story could be true, but Comey simply thought that Trump was sticking up for a friend but wasn’t trying to strong-arm Comey, just to put in a good word for Flynn. The story is true and President Trump was trying to obstruct the FBI investigation of General Flynn. Obstruction requires what’s called “specific intent” to interfere with a criminal case. [and we know how hard it is to prove intent to Comey] If Comey concluded, however, that Trump’s language was vague, ambiguous or elliptical, then he has no duty under the law to report it because it does not rise to the level of specific intent. Thus, no crime. So something tells me that if the letter does exist, Comey will testify that Trump was not trying to obstruct justice. Is this a satire? Or is it just as true as some of the mainstream media reports.